4.3.3.10 Governmental funds should be reported using the current financial resources measurement focus and the modified accrual basis of accounting. The governments have the option to report the budgetary information in the governmental funds financial statements instead as a part of the required supplementary information. 4.3.3.20 The financial information is required to be reported separately for general fund, each major governmental fund and nonmajor governmental funds in aggregate. 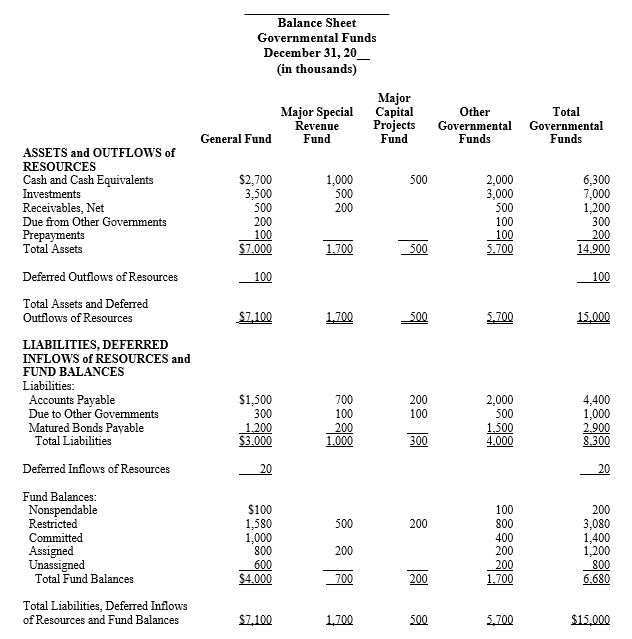 General capital assets and general long-term liabilities are not reported in the governmental fund balance sheet . Interfund liabilities should be reported as fund liabilities regardless of their date of scheduled repayment. Interfund loans may be reported as short-term or long-term liabilities depending on their conditions. The governments should also show the reservation of the fund balance for the noncurrent interfund receivables. Equity interest in joint ventures should not be reported as an asset in the governmental fund balance sheet except for amounts that meet the definition of financial resources (e.g., receivable from/payable to joint venture, etc.). All equity interest should be reported in the government-wide financial statements. A reconciliation that shows adjustments made between the balance sheet and the government-wide statement of net position is required on the bottom of the report. See Conversion and Reconciliation between the Government-Wide and Fund Financial Statements. If any categories of the fund balances are displayed on the face of financial statements in aggregate, the specific components and purposes must be disclosed in the notes to financial statement. Capital assets used in governmental activities are not financial resources and therefore are not reported in the funds. Other long-term assets are not available to pay for current-period expenditures and therefore are deferred in the funds. Internal service funds are used by management to charge the costs of certain activities, such as insurance and telecommunications, to individual funds. The assets and liabilities of certain internal service funds are included in governmental activities in the statement of net position. Some liabilities, including bonds payable, are not due and payable in the current period and therefore are not reported in the funds. The notes to financial statements are an integral part of this statement. 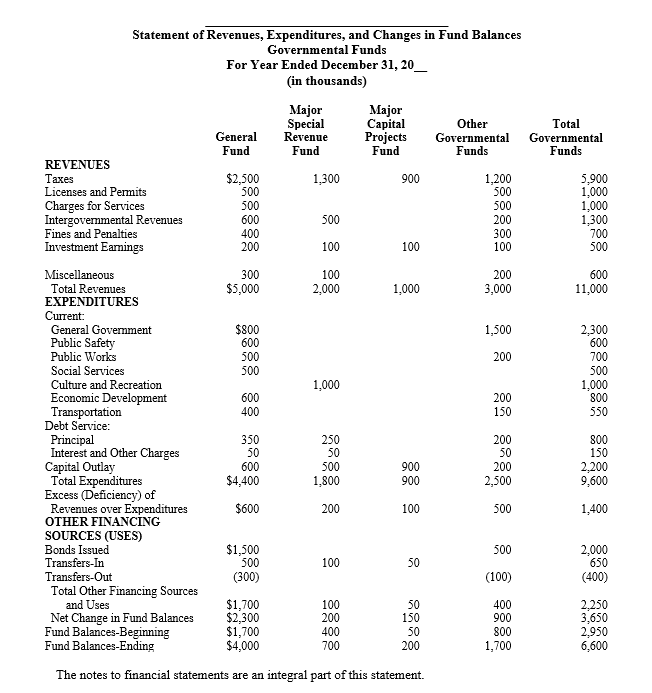 4.3.3.40 The governmental fund statement of revenues, expenditures, and changes in fund balances reports information about the inflows, outflows, and balances of current financial resources of each major governmental fund and for the nonmajor governmental funds in the aggregate. There is one permitted format for the statement. Governmental fund revenues should be classified by major revenue source (taxes, licenses and permits, etc. ); expenditures – by function (e.g., general government, public safety, etc.). However, the governments can report additional details on the statement. Debt issue costs paid out of either debt proceeds or from existing resources should be reported as expenditures. The face amount of the debt should be reported as other financing sources and debt premiums or discounts should be shown as a separate component of Other Financing Sources (Uses). Payments to escrow agents for bond refunding from the proceeds of the refunding (new) debt should be reported separate category in Other Financing Sources (Uses). Sales of assets (unless they are considered a special item) and transfers should be also shown as separate categories in Other Financing Sources (Uses). Extraordinary and special items should be separated on the bottom of the statement. For more details see Statement of Net Position. A reconciliation that shows adjustments made between the statement of revenues, expenditures, and changes in fund balances and the government-wide statement of net position, is required on the bottom of the report. See Conversion and Reconciliation between the Government-Wide and Fund Financial Statements. They are reported only on the government-wide financial statements.